380 pages | 13 B/W Illus. Internet gambling is a rapidly growing phenomenon, which has profound social, psychological, economic, political, and policy implications. Until recently, Internet gambling has been understudied by the research community, but now a growing body of literature is emerging, on all aspects of Internet gambling and its attendant implications. As jurisdictions around the world grapple to understand the best way to respond to Internet gambling from a commercial, regulatory, and social perspective, scholarly studies of Internet gambling are becoming an ever more crucial resource. 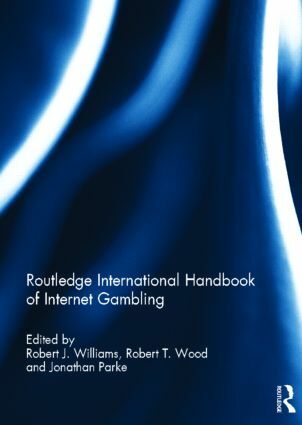 The Handbook of Internet Gambling consolidates this emerging body of literature into a single reference volume. Its twenty chapters comprise groundbreaking contributions from the world’s leading authorities in the commercial, clinical, political and social aspects of Internet gambling. It is sure to be a foundational resource for academics, students, regulators, politicians, policy makers, commercial providers, and health care professionals who have an interest in understanding the history, dynamics, and impacts of Internet gambling in a global context. Robert Williams is a professor in the Faculty of Health Sciences at the University of Lethbridge, Alberta and also a Coordinator for the Alberta Gambling Research Institute. Dr. Williams teaches courses on gambling and provides frequent consultation to government, industry, the media, and public interest groups. He is one of the world’s best funded gambling researchers and a leading authority in the socioeconomic impacts of gambling, Internet gambling, prevention of problem gambling, the proportion of gambling revenue deriving from problem gamblers, the prevalence and nature of gambling in Aboriginal communities, the etiology of problem gambling, and best practices in the population assessment of gambling and problem gambling. Robert Wood is an associate professor of Sociology, and Dean of the School of Graduate Studies, at the University of Lethbridge. Over the past decade, Dr. Wood has been involved in a number of large scale research projects, dealing with various socio-cultural aspects of problem gambling. He is known particularly for his studies on Internet gambling, the link between government gambling revenue and problem gamblers, and the prevention of problem gambling among teens. Jonathan Parke is a senior lecturer at Salford Business School, University of Salford. Dr Parke has published over 30 peer-reviewed journal articles, book chapters, government reports and other publications and has given over 40 conference papers and talks regarding internet gambling, poker-playing, electronic gaming machines and gambling-related risk.